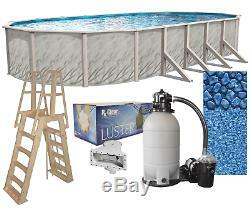 Above Ground Oval MEADOWS Swimming Pool w/ Boulder Liner, Ladder & Filter Kit. The MEADOWS above ground pool is elegantly designed pool features a super strong steel wall that has been hot dip galvanized for protection. The champagne colored frame compliments the look of the wall and will add a touch of beauty to any backyard. The pool frame has a resin coating that helps protect the steel from the elements and help this pool to last for years to come. Wall Height: 52 wall height. Boulder Swirl 20 gauge overlap liner. 16" sand filter tank w/ 1 HP Pump (Made in the USA) (Note: 15' x 30' includes a 22" tank w/ 1 HP pump). Kit also includes our newest and greatest Rx Clear sand filter alternative media to sand.